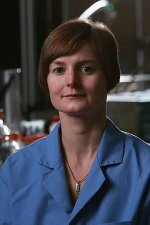 Congratulations to Dr. Carolyn Pearce at Pacific Northwest National Laboratory on contributing to a chapter in a new book, Microbial Metal and Metalloid Metabolism: Advances and Applications. The study of microbe-metal interactions has led to innovations and discoveries, such as development of microbial fuel cells, pili that function as "nanowires," and new, enhanced approaches to bioremediation. Scheduled for release in June, the American Society for Microbiology publication reviews the current state of research in the field, as well as emerging developments and applications, and forecasts future research directions. One of five authors, Pearce lent her expertise in microbial synthesis of nanominerals to the writing of "Nanoparticles Formed From Microbial Oxyanion Reduction of Toxic Group 15 and Group 16 Metalloids." Written as a review chapter providing background information, the chapter also includes snapshots of current research in this up and coming area. "Studying the microbial transformation of elements such as selenium, tellurium and arsenic in the environment from highly toxic states to more stable, less toxic phases has applications in a variety of areas from bioremediation to health benefits," said Pearce. Potential applications of the nanoparticles formed as products of these transformations include the next generation of nanoscale optoelectronic materials. Pearce's current research interests include investigating how iron(II)-bearing minerals affect reduction and oxidation of key contaminants, including technetium and uranium, in the subsurface at Hanford. Pearce joined PNNL in 2009 from the University of Manchester where she had a Research Councils UK fellowship to study microbial synthesis of nanominerals using synchrotron-based techniques. She is an honorary senior lecturer at the University of Manchester, School of Earth, Atmospheric and Environmental Sciences, and has authored or co-authored more than 30 papers in a range of disciplines.